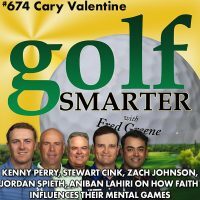 674: Cary Valentine returns to share his conversations with PGA Tour players at Hawaii’s Sony Open. Not a usual reporter, Cary is a mental game coach for a college golf team and he wants know how faith influences the mental game of some of the best players in the world. Included in these conversations are Zach Johnson, Kenny Perry, Stewart Cink, Jordan Spieth, and Aniban Lahiri. Host Fred Greene’s local course, Peacock Gap in San Rafael, CA is the beta site testing a new food mobile drone that offers on-demand food or beverages service delivered to any player on the course. They don’t expect this will replace the usual beverage cart, but those aren’t always available and this can operate whenever the course has players. Watch the short video here at https://youtu.be/oy0lIszidT4 of interviews and footage of the drone in operation. The audio from all new episodes of Golf Smarter are now available at YouTube.com/GolfSmarterTV. This episode is brought to you by TWG! Get an extra 20% off apparel with the coupon code “golfsmarter” at checkout. See the great selections at TGW.com/golfsmarter. Some exclusions apply. Excludes all Titleist, FootJoy, Under Armour items and select NIKE items. Cannot be combined with other discount offers. Due to manufacturer policies, some other items may also be excluded. Ends 2/5/19 at [11:59] PM CT.